A long-term effort to improve service for residents of Northern Maine has ultimately resulted in the award of commercial jet service by a legacy carrier to the recently rebranded Presque Isle International Airport (PQI). What began as a 1942 military training facility and group of outdated buildings is now a modern general aviation terminal, fixed base operator and flight school all in one building. 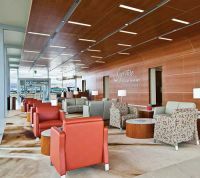 In August, Ohio State University Airport/Don Scott Field (OSU) opened its new $15 million Austin E. Knowlton Executive Terminal and Aviation Learning Center. Fernandina Beach Airport (FHB) didn’t simply build a new terminal to handle general aviation operations for Amelia Island, just off Florida’s northeast coast. The project team took a page from the community’s history book and designed the building to resemble the iconic 4FU Corsair aircraft that flew from the airport during World War II. In 1965, a forward-thinking businessman and aircraft operator named Robert Morrison marshaled local politicians and civic leaders to create the Ashtabula County Airport Authority for the purpose of developing an airport that would serve as an economic driver for Ashtabula County and northeast Ohio. When Devon Brubaker began his job as manager of Southwest Wyoming Regional Airport (RKS) in spring 2015, many residents of the southwest Wyoming community were not even aware the airport offered service to major connecting hubs. Since then, his team has worked with SkyWest Airlines to create more affordable flights, supported by more effective marketing; and Brubaker is proud of the results. The Metropolitan Nashville Airport Authority gave contractors 60 days to rebuild the runway and terminal at John C. Tune Airport (JWN), and collectively, they rose to the challenge. In order to provide numerous crews with around-the-clock access to multiple worksites, JWN officials closed the airport from June 1 to July 30, 2015. When Signature Flight Support opened a new $82 million corporate aviation facility at Norman Y. Mineta San Jose International (SJC) in early November, airport officials were thrilled to have a second fixed base operator on the field. They also viewed the new tenant as a larger symbol of what is and has been happening at the airport that serves California's Silicon Valley. One of the primary tenants at the new facility is Blue City Holdings, which represents the principals of Google. In fact, the company financed a significant portion of the hangar development, reports Signature. Located near the center of "Tornado Alley," Wayne, NE, (population 5,500) has had its share of twisters. But the EF4 that roared through the tiny town in 2013 was especially cruel, damaging or destroying nearly everything in its path - including much of Wayne Municipal Airport (LCG) Stan Morris Field. Persistence from local aviation investors and the closure of another nearby municipal airport have spurred unprecedented development at Alberta's Villeneuve Airport (ZVL). Located in a rural area northwest of Edmonton, the two-runway general aviation airport currently handles approximately 54,000 movements per year; but traffic is expected to grow over time. Outagamie County Regional Airport (ATW) in Appleton, WI, significantly raised the industry standard for sustainable design and construction when it opened a new general aviation terminal last fall. Those involved with the project predict that the $3.6 million facility will be the nation's first net zero energy airport building. Currently, it's undergoing a full year of measurement and verification. Cleveland, TN, is a small-town community with big-city business partners. What it didn't have was an airport capable of serving its partners' travel needs. But that recently changed, when Cleveland Regional Jetport (RZR) opened in late January, replacing the area's previous airport, Hardwick Field. The retro-looking terminal at Page Field (FMY) in Fort Myers, FL, belies the airport's otherwise modern character and non-traditional approach to business as a general aviation airport. A $32.6 million overhaul that spanned nearly two decades from planning to its recent completion transformed FMY from a deteriorating, debt-ridden facility into an updated, eco-friendly and financially stable reliever airport. Its terminal, however, is fashioned after a World War II-era structure, in tribute to the airport's military roots. For years, general aviation customers at Chattanooga Metropolitan Airport (CHA) longed for new service providers to help drive down higher-than-average fuel prices and hangar costs on the south Tennessee field. Less than two years after Paulding Northwest Atlanta Airport (PUJ) officially opened its terminal doors, airport director Blake Swafford is leading the charge to reconstruct the "greenfield" general aviation facility that was destroyed by an EF3 with winds in excess of 165 mph. February marks the opening of the first new airport built in Kansas since 1989: Rooks County Regional. The new airport replaces two low-use grass airstrips in the cities of Plainville and Stockton with a paved runway on newly acquired property in between. With active general aviation traffic, Myrtle Beach International Airport (MYR) could no longer route such passengers through a former Air Force base operations built in 1956. With traffic from air ambulances, game hunters, corporate executives and local fliers, South Dakota's general aviation (GA) airfields serve a wide variety of pilots; and state officials recognize the benefit of providing them with current weather information as they fly in and out. From barbecue to football, residents in Texas like to say everything there is the "biggest and the bestest." Sugar Land Regional Airport near Houston, however, backs up the sentiment with stats and evidence. Some people tidy up for special guests. Others go all out. Blue Grass Airport (LEX) in Lexington, KY, rolled out a new $27 million runway and $10 million in terminal enhancements to welcome arrivals for the Alltech FEI World Equestrian Games, held at Kentucky Horse Park this fall. When U.S. Naval Air Station Cecil Field near Jacksonville, FL, appeared on the Department of Defense's Base Realignment and Closure list, the area's civil airport community eventually benefited. In 1999, the Jacksonville Aviation Authority (JAA) took ownership of 6,000 acres and 1.1 million square feet of building space on the 17,000-acre airfield. When a storm destroyed the general aviation terminal at Greenville-Spartanburg International in 2007, the local aviation commission didn't hold a grudge against nature. If fact, it resolved to build the most Earth-friendly, environmentally sensitive building possible, within economic reason. What it got was a facility currently being considered for silver or gold level Leadership in Energy and Environmental Design (LEED) certification. The Kansas City Aviation Department faced quite a conundrum a few years ago - what to do about its general aviation facility, Charles B. Wheeler Downtown Airport. When plans began for the Branson Airport (BKG), general aviation traffic and a fixed base operation (FBO) to support it were not on the radar, says Sharon Morris, the airport's aviation services manager. Imaginative ideas are the basis of projects covered in this March/April issue. Know of a project that should be covered in a future issue of Airport Improvement? AIRPORT IMPROVEMENT is published bi-monthly by Chapel Road Communications LLC, 3780 Chapel Road, Brookfield, WI 53045. All statements, including product claims, are those of the person or organization making the statement or claim. The publisher does not adopt any such statement or claim as its own and any such statement or claim does not necessarily reflect the opinion of the publisher. Printed/published in the USA. Send address changes to AIRPORT IMPROVEMENT to 3780 Chapel Road, Brookfield, WI 53045. All rights reserved. Permission to reprint or quote excerpts granted only upon written request.